We are in the midst of a national crisis in writing. According to the National Center for Education Statistics, less than 30% of grade 4, 8, and 12 students in the nation are proficient in writing. The same report found that only 1 percent of 12th-graders nationwide could write a sophisticated, well-organized essay. In 2012, high school graduates achieved the lowest scores ever on the writing portion of the SAT–well below proficiency level. A recent Gallup survey found that only 11% of employers believed graduates had the necessary skills to succeed in the workplace, with writing cited as a major deficiency. In our knowledge-based economy, communication skills are more critical than ever. According to the College Board, “it is almost inconceivable to achieve academic success without good writing skills”. This is a compelling reason for us to band together and start a writing revolution! Fifty years ago, elementary teachers in classes across America taught students the fundamentals of good writing–which they practiced daily. This writing instruction was explicit and deliberate, beginning with letter formation, moving to spelling and vocabulary, developing into sentence construction, and then intensifying into the full blown writing process–consisting of planning, drafting, editing, and revising. Around 25 years ago, we adopted a more laissez-faire approach, relying on grammar instruction and reading comprehension to inform writing. Sure, children were learning vocabulary and mechanics, and perhaps doing some creative writing, but they weren’t systematically incorporating this into daily writing practice. Here are three steps to starting a writing revolution in your school. Implement a Structured Daily Writing Program. 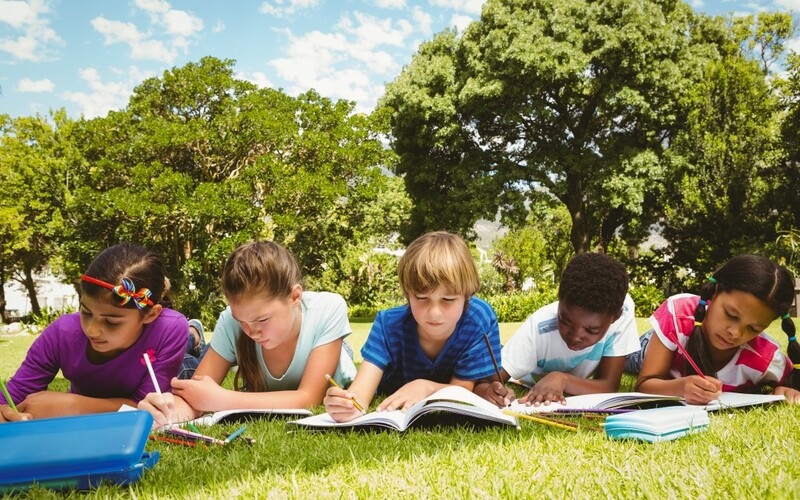 At the elementary level, students should be writing every day, forming letters and drawing pictures at the kindergarten level, and composing five-paragraph essays in the three key genres of writing–narrative, informative/explanatory, and opinion/argumentative writing–by grade 5. This structured daily writing will allow for all of the vocabulary, grammar, and reading comprehension skills to be practiced in their writing. While journal writing is encouraged, structured writing is necessary so that students are expressing their thoughts as coherent arguments and complete essays. At the middle school and high school level, students should be writing at least three times a week and exploring new genres including cause-effect, problem-solution, response-to-literature, autobiography, research-paper, and compare-contrast essays. At this level, the foundation built at the elementary level will allow the students to diversify their skills, and write for different purposes and audiences. Encourage Writing “Across the Curriculum”. English language class should not be the only class where students write structured essays. We have found incredible results when students write essays in social studies, science, math, and physical education classes. Imagine the mastery of algebra that can be achieved when a student is asked to write an essay on how to solve an algebraic equation–explaining an unknown variable and the mechanics of manipulating an equation along the way. Writing forces students to discover a topic, develop a thesis, conduct research, and master a subject. It also offers a great partnership opportunity for teachers in the school. For example, English language teachers can work together with Social Studies teachers when asking students to address, in their writing, the causes of social issue and solutions to these issues. Create Schoolwide Writing Symposiums to Display Exceptional Student Work. Allowing students to share their writing gives writing a purpose. Over the last 20 years, we have found that schools which implement annual writing contests achieve tremendous outcomes. The energy and anticipation for the year-end writing celebration builds throughout the year as students work to perfect their craft–similar to the school’s annual music concert. The competitive spirit pushes students to produce higher quality essays, where writing truly comes alive. An investment in a schoolwide writing program will bring multi-year benefits to your school as students get on the same page and grow together over the years. Take inspiration from New Dorp High School in New York which adopted this strategy in 2008. In just two years, they saw graduation rates climb from 63% to 80%, with three times as many students enrolling in college-level classes. Join the writing revolution and watch your student thrive!